A great new hat concept for the holiday season! 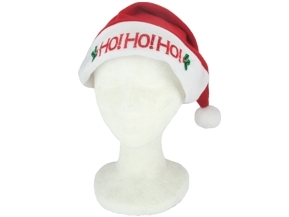 While this looks like a regular 'Santa Hat' with "Ho! Ho! Ho!" on the front, the design contains dozens of tiny red lights that blink. 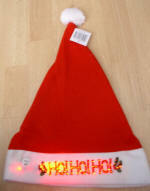 A very cool effect sure to bring out the holiday spirit in anyone! Batteries included. One size fits most. The small battery housing tucks inconspicuously into the side of the hat. One size fits most adults (measures about 22" inches around the base).